How many here are voting in advanced polls? I did this morning. I didn't need any more debates to make my selection. It seemed a lot were on the same page as the line to vote never was smaller than 10 people waiting in line, and 4-8 inside to vote. The line moved rather quickly, and the parking lot outside my polling center was steady with traffic. City Centre Mall's advanced poll had insanely long lines during the lunch hour. I'm going to try to vote there at some point this week; if not, there are other advanced polls closer to home. Did so this evening. Five-minute wait, tops. Nice to get that out of the way. Elections Alberta has previously said that they expect 10% of ballots cast to be done at the advanced polls. Welp, according to what I'm reading, 140K+ votes have been cast as of 7pm tonight. That's about 10% of the 2015 vote. I don't use advance polls simply because an election is the only time I ever go to a church. that's a massive increase in voters. It's insane. Curious to see how the numbers continue over the next few days. I plan to vote tomorrow morning. Why are advanced polls taking longer to count? It is a massive increase, and a bit of a sad comment when I can see the word "insane" a fitting adjective. Voting should be commonplace, but here it sadly isn't that common. I really hope for an insane turnout. Since you can "vote anywhere" early now (a fantastic reform! ), it will take days for those ballots to be processed, sorted, and sent to the main Elections Alberta warehouse. We may not know the final results until April 26! The biggest thing I get from that CBC article is the large influx of new registrants. It looks like people are not staying home this time. Because you can vote anywhere, so they'll take longer. I think most people will go to a polling station near them..jmho. I'd hope they'd be sending sealed boxes to the warehouse, and start counting these on the morning of the 16th. Advance polls end on the 13th. With this turnout, a call for extra volunteers to count the advance votes may get results. I'd do it. Something tells me that the students at the U of A probably voted UCP - Not. This is the thing that most concerns me. While I can understand the rationale for such a thing the reality is the election results will be far delayed in some ridings. 10 days to figure out who your MLA is going to be is ridiculous. Who thought that was acceptable? Correct me if I'm wrong but advanced polls are not tallied in advance due to concerns that any numbers or tabulations could get out and potentially impact the election day results. These are locked boxes until the election is finished. There is no way to advance count those without grievous risk that the whole election day results could be tainted by any leak. These are ballots, not polls. Results could be very influencing. ^I prefer to vote on the day, as I want my vote to influence who has "won" overall, per the results. While the advance polls still matter, and in the rare situation of a very close race could be the difference, in most cases they just influence a few seats where its a toss up. i also prefer to vote on election day, because walking to the local polling place is a community event, with half the neighbourhood out. It's like a little festival of democracy. I voted by Special Ballot because I knew I would be away for all the Advance Polls and on Election Day. Filled out the form on the Website, selected the option of voting at the Electoral Office and received a call from them within 48 hours that my Special Ballot was ready. Dropped by and because Nominations were not as yet closed, the instructions were to hand write one's selection either of an already entered Candidate or by Party. Needless to say they'll not be counting a vote for the United Cretins from me. This is a minor price to pay when expanding voting access in the province. 10 days to find out who your representative will be for the next four years isn't so bad. It's not like this is California where we only found out the final results in some contested congressional districts nearly a month later. Has anyone ever had to provide proof of citizenship when voting in Alberta? Seems to me, if your name is not on the roster you don't have to prove citizenship to vote. All you need is a driver's license. A non-citizen may posses a drivers license as the requirement to get one is proof of legal residence as opposed to citizenship. Last edited by Safir; 10-04-2019 at 11:37 AM. 10 days seems like a lot of a delay. One would not think it should require this much time. I think I could feel better about it if I knew more about why the time delay would be 10 days. I don't look at it as a minor inconvenience either. In my Canadian voting experience this is unseen. I've spent half a century of life following elections and knowing election results on election night. This is a completely different phenomenon. My whole notion of democratic process in this country was knowing the results of an election, on the night of an election, this is completely a different thing now, imo unacceptable. Agree. Who came up with this idea?? But seriously, I don't know that they should have gone this route without some plebiscite or moratorium allowing it. This is the most significant difference in elections seen in our time and I have trouble seeing it as net positive. Regardless of election result, I've seen it as a standard in this country to have election results, on election night. This is a game changer, and without requisite public feedback imo. Only confirms to Top_Dawg what he hears all around the province. People just can't wait to get rid of the ********. Top_Dawg figgered ol' scarecrow might retain 10-15 seats in Garlic Town but this indicates she might be headed for Kim Campbell territory. I don't think the advanced voting is indicative one way or the other of what way those people are voting. Just that they are either frothed into a hurry, one way or the other, of doing it, or have to due to personal circumstance. For all we know the advanced voting could be for UCP or NDP. Its only 2 relevant parties in anycase. Mandel and Khan failed to support their position that a vote for them is not a largely wasted vote. This is a two pony race with some sideshow. Notley should lead the NDP federally..Singh is a complete disaster. Agreed. Notley has been in power and has seen that it is nigh impossiBRU to govern from the left once in power. If one is sane. She's the Bill Clinton of Canada at this point. I didn't say count on the 13th. I said start first thing on the 16th. 0700hrs. Just like a jury, sequester the volunteers in a room to commence the counting early. No phones. Bathroom breaks in the same building. Smoke breaks are monitored outside. The point is, like a jury, there are options. You don't care if they see TV, and after the polls close, who cares if someone leaks anything....it's all over but the counting. If the concern is the length of time, then get started early within an acceptable window where you can control the release of information w/o unduly harming the current voting process. 10 days is a significant delay in our system. This should not have been implemented without a mechanism to get the count in efficiently and early. The advanced polls close on the 13th. Truck them to the warehouse. Get your army ready early on the 16th. Have an EMT or two on site. Nobody leaves until the polls close unless there is a huge health emergency...and then they are still sequestered until the polls close. Sure, this suggestion may not be perfect...but it is a start and a darn sight better than a 10 day delay. my poll today had 100+ cars in the parking lot. By the time I voted and left the line started to get pretty long. Wow. Whatever the outcome, I'm glad people are voting!!! I am going to wait till election day to vote because I want to see if the RCMP finds more damning information about the Kamikaze candidate scandal. If it is proven that Jason Kenney cheated in becoming the UCP party leader, will the party have to remove him as premier and elect someone else from within the party? Notley said in an interview with Braid( Calgary herald) He hasn't been charged with anything. I don't think he will be. The RCMP are investigating and what we are seeing is the workings of the free press we still enjoy in Alberta and Canada exposing the type of people who run the UCP for what they are - dishonest. A died in the wool liberal talking about political dishonesty in Spring of 2019. Too much irony. Your mistake is attempting to divide the discussion between conservative and liberal factions. The issue at hand (more appropriately staged in the Ethics thread) is that the UCP has, once again, illustrated their blatant disregard for ethics by their egregious leadership-race tactics. That the previous post was perhaps by someone liberal leaning, or that the UCP includes "conservative" in their name is entirely irrelevant. The irony is a far-too-ubiquitous disregard for the (lack of) ethics of one's party by acknowledging the ethical shortcomings of some other party. Stop it. Can somebody explain how this vote anywhere works ? If I go to the IKEA, vote there, could I not just go to the one at another location and vote there ? I know I am supposed to bring the voter card, but I heard that is not mandatory. Next question, if I vote on Saturday, does that information get filtered down to my local voting location before next Tuesday ? If you’re away from home and looking to vote in advance polls this election, you’re in luck. Elections Alberta is rolling out new technology to allow anyone to vote early from anywhere in the province. Albert Delitala reports. I'm not in anyway, nor have I ever been a UCP/Wildrose supporter. I'm not anywhere right wing on the perspective. I wasn't defending UCP, not my intent. My interest in how much myopia there could possibly be in Liberal supporters and Yeg is very known to very polarized. In otherwords would support and accept ANY liberal party and ANY behavior. Just because they had a stop Notley sign up, wow. Lines are very very long in Calgary..a good turnout..
Another 127,000 voted today, for a total of 403,000 votes. 422K have voted now. Um why? This is off the charts. While its positive theres more voting this puts immense pressure on staff at poling stations handling all the traffic. Why would people wait in line for long periods of time to advance vote instead of just voting on the actual election day? Its still one vote, doesn't make any difference when other than this is putting crazy unpredictable stress on the advance polling stations. I don't think anybody could have foreseen this much advance traffic. Is advance voting now going to be the mode? This is more costly to maintain, provide, and staff. There used to be a notion, and implied consideration, that you would use advance voting ONLY if you can't vote on election day. At one point they used to even ask people why they were advance voting. Now this seems completely transformed. When did this change from advance voting only being used as a necessity for it just being on a whim? Finally, are work places no longer complying with the regulation that they HAVE to give people time off to vote on Election day? Or are people not aware this is their right, so that they can vote actually on election day, as intended. Last edited by Replacement; 11-04-2019 at 11:16 PM. Maybe some people figure the lines will be even longer on election day. We voted because we knew who we were voting for, and just wanted to get it over with. Are we bad people for doing so? not surprised its been busy. Why even have election night then? To me theres something happening in democracy that is off right now. That you or anybody could say "well we know who we are voting for anyway" trivializes and makes a lark of the democratic process. If people could vote one week in advance and it doesn't matter to them then they could vote one month in advance and it doesn't matter to them. At which point it just becomes (and is) brand democracy. Simply partisan flocking. Or reactionary voting. That is not an ideal expression of democracy. Apparently as a society we're so politically static now that we don't even see any reason why we might wait until election night to vote. I'd already stated my reasons why voting on election night should be encouraged, it minimizes costs of an election. It also maximises SECURITY of election results and minimizes possibility that anything could happen to ballot boxes. But theres a whole other level of concerns with prevoting. That it hilites it doesn't even matter to people what happens in the last week or more of the campaign. Like it doesn't exist. But if its only brand allegiance getting voted for and minds already made up then it completely services that any party in office can do what they like, performance, actions, results, accountability doesn't matter, just partisan, rote, allegiance. Now those examples are jurisdictions that allow a much earlier time frame in voting but the concept stands. Reinforcing, and encouraging, and facilitating early voting ultimately reinforces brand, partisan allegiance, it sends a message from the electorate that X party or candidate have their vote regardless, that it doesn't matter what occurs, their vote is automatic. This represents a scary erosion of democratic process. The campaigns it seems matter less and less. This is a slippery slope. At least here we are containing the time frames. Early voting is a concern, and its a concern that's being expressed wherever it is occurring. That it is increasing to this degree in numbers is a known, its happened everywhere its allowed. Tendency to use it increases. But it alters the electoral process, and even results. Last edited by Replacement; 12-04-2019 at 09:16 AM. Democracy was dealt a blow 100 years ago when Freud's nephew was contracted by the US government to convince the population to get involved in European entanglements. Brand democracy, as you call it, is manufacturing of consent. I am willing to confess I am envious of the Chinese at this point. MSM seems to think it's great, that we've had a very good turnout so far. A few volunteers think it's helpful, because on election day, they couldn't keep up..I see no reason to wait to vote, so I voted..I think, you're over thinking this,. I got calls from both parties urging me to vote early. In the end, I did vote early but mostly because the polling station was downstairs from where I work. Not really, the concerns are legitimate, and its a slippery slope. What is typically seen in other jurisdictions is amount of people early voting, proportion of early voting, and length of time of early voting all increase as its allowed. This reshapes elections. South of the border where you can early vote a month before in elections its resulting in very different results. But the chief concern is it signals that the actual campaign is null and void. That its just brand loyal democracy. That the sign on your lawn may as well be telling people that you chose Tide detergent, because you've trivialized your vote enough to be devout brand allegiance. In this case, as its stated, we get the democracy we deserve. Partisan politics is increasing, and a huge threat to ideal democratic process. I know HL you see this when its the Trudeau liberals holding power and getting blanket support, but you should see it too on any other side of the spectrum. Voters should ideally be more fluid than they are. Maybe then our politicians might be. Last edited by Replacement; 12-04-2019 at 09:40 AM. Safir was close a couple of posts up. People like convenience, and that includes time and place. All these polling stations makes it as handy as a 7-11. Everyone seems to be strapped for time these days, in a rush to get things done. That was the thrust for online voting. If a person has settled on who they'll be voting for, I can't see any problem in how it's implemented. And if it results in a higher turnout then that's a plus, too. I would never vote NDP, never. I would never vote for JT, so what's left..
Mandell has good ideas, but i don't feel like voting for him this time..it's done and dusted.. Multiple studies and results suggest voter turnout is not necessarily increased through early polling as an unintended drawback ensues where there is no longer any salient feeling of there being any election day. Some suggesting in studies that removing the importance and magnitude of an election day results in making it easier for some to just ignore voting altogether. Its not established fact that allowing early polling does actually increase turnout. Its just extra cost of having polling stations open, for no clear benefit. I like the advance voting, especially when people have more opportunities to vote. We’ve had enough apathy in past elections. The undecided like me needs something to tip our hand. For me, it was the leadership debate combined with a news story. I was done. Time to cast my vote. I don't think the advanced polls are a waste. The arduous count is. Being able to vote anywhere in Alberta is very convenient, that is why you are seeing a massive spike in voter turnout. Now folks can complain about how long it takes to count them! ...only because if we have implemented the tech to have this advance polling anywhere, the logical conclusion would include the ability to count them quickly. While I'll be watching for on election night is the impact if any on overall voter turnout. Hopefully turnout will be higher. Or is it just people who would have voted on election day voting in the advance poll instead? I know the NDP put on a big push for their supporters to vote in the advance poll. Not sure about the other parties. The goal of the push for more advanced voting was to make it easier for more people to vote. 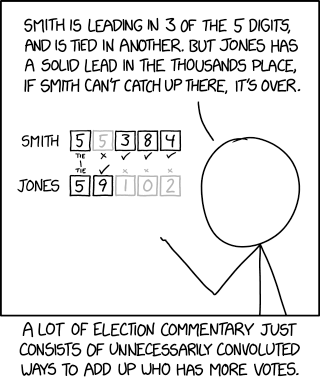 It would be illogical, and wrong, to assume that a method to count votes quickly would be part of that push - it's a totally different issue. And in the couple articles I read when the new system was announced it was also stated that it could take up to 10 days to count those votes because they can't just be dumped into a (virtual) tub along with the other votes. I voted at City Centre Mall yesterday since there's a good chance I'll be too busy with work on election day. Yesterday was the last day for advance polls -what exactly happens with them today, tomorrow and election day? Do they just sit there collecting dust until election day polls close? No, they are not different issues. ...unless you subscribe to the half done approach. In change management/BPR, the idea is to look at the entire process flow. Your outcomes document will illustrate the end goal, which is to allow easier access and even more frequent access to voting to increase voter engagement. The subset process maps would have to be divided into polling centres, distribution/collection, and counting. The overall goal of process efficiency that would drive the entire end-to-end system would be paramount, and vote counting is a crucial end process. The Canadian system prides itself in rapid and calm transfers of administration/"government" as to avoid too long of a period of flux and indecision. I know I've developed far more complex processes than this for companies globally, and I know others here in town who are as competent or moreso, so my "complaint" is that while this is nice to vote when your mind is made up vs trying to shovel it into one day, the end processes should be completed to not be partially pregnant. ...so basically a process issue based upon the inability to even think ...er...outside the box. I'm sure the ballot counters will be counting day and night. That process is enshrined in the VotingAct, or whatever it's called in Alberta, so it has restrictions, like waiting for balloting to be closed before counting, that defy simple assumptions about how things "should" be. So in your estimation it "should" take 10 days to count ballots? Thanks for the post above Richard. Excellent comments. The end process is indeed election results, its the whole reason to have democratic election. 10 day delay is inexcusable and entered into, ironically, out of a notion of convenience. As in its apparently convenient to have 10 days of non governance as a direct cost of the voting convenience initiatives. What about electoral convenience? What about a result? What a 10 day circus this is going to be. Now add that in some ridings there will likely be recounts or requests thereof in close races. What happens in those? How long the delay? What about out of town people that receive their ballot late and have it in transit arriving within the 10 days. Are those admissible, or not? Just because you can do things differently doesn't mean its automatic that things should be done differently, just because theres a thought that it can be done. The out of country voting turned out to be a complete fiasco. Why should government offer something like that in which its unlikely they will actually deliver? We're trusting a govt to send out ballots internationally, efficiently? Really? I would have bet against it happening. Last edited by Replacement; 14-04-2019 at 05:53 PM. Non-governance? Really? As soon as the election is over we're teetering on the edge of anarchy? In every election, there's time between the winners being announced and their being sworn in. It's not like the winner gets to walk into the premier's office and start tossing things out the door as soon as they're declared the winner. They don't get to start speaking on behalf as the province until they take the oath. That's what people are complaining about because of a possible, not guaranteed mind you, but possible, maximum 10 day delay. Claiming that there will be nobody running the province? firstly, as i understand it, you could cast a ballot for any candidate in any riding from any advance poll in the province and there needs to be a verifiable "chain of custody" for each and everyone of them. there were 267 advance polls in the province and you could cast a ballot for any candidate in any of the province's 87 ridings in any one them. at the end of the above "chain of custody" the returning officer for each riding must be able to certify the final counts, all of which take place by hand under the supervision of scrutineers appointed by each candidate in each riding. there is no way that all candidates will be able to appoint scrutineers at each advance polling location in addition to each polling station in their riding. the result is that all of the advance polls ballots will be shipped to a warehouse in Edmonton where they will be counted starting on the 17th. does this mean some ridings results will be in question until those votes are added to the election night tally? possibly. but that's really no different than ridings in the past that have been subject to recounts and potentially ubsequent judicial recounts for some time after election night. as for the 10 days of non-governance you seem so concerned about, the government has always remained the government until those elected are sworn in by the lieutenant governor. the province isn't non-governed in that interim, the government that was in place prior to the election remains the government until the lieutenant governor approves the next one. for perspective, the election in 2015 was on May 5 and the new government wasn't sworn in until June 1 - 26 days later. I don't deal in simple in my life. Neither do many of my peers in this city and elsewhere. You would take those base pieces of hard requirements (voting times, legislation) and work towards satisfying both goals. It is the 10 day process that has people a bit steamed. You know this is coming, you put out a process where "vote anywhere" is supposed to be an advantage, and your customer base takes full advantage. By some quick math, we are already almost 50% of the 2015 entire voter turnout, and the majority of the advanced voting was in constituency. Either the process was designed expecting abysmal turn rates - which begs the question of why introduce the process improvement if the take is expected to be low - or they did not follow the entire process through and build a robust count procedure at the end which is both legislatively compliant and expeditious. They wouldn't be the first company/government to do so...and they won't be the last. Personally, I loved the advance polling. Like I said earlier, once the debate was over +1 news story my mind was made up. All the extra campaigning in the world wouldn't have changed my mind. I am confident I made the right vote. I, like many others, just want the results out, and life to move on. I will deal with whatever administration the voters decide, but the limbo is excruciating. Chain of custody concerns are already in place for things like evidence, large cash moves, gold, dangerous goods, in bond items, etc. The process for this is not that arduous. Rural polling stations from what I saw were one day only things, with only 1 rural polling station open in a constituency in a day. I could be mistaken for some larger rural constituencies. Resources shouldn't be that hard to come by, and this should be a piece of the puzzle you put in place as you offer such a service. Again, the outcomes mapping would bring these to light as requirements given the legislation in place. Your more urban polling stations had multiple days - if not every day - so again the chain of custody issues could be dealt with. From what I understand, for the most part they were. If there is a concern with hiring resources to transport secured documents, well, that is a cost that should be borne out of the process mapping, and included in the service costs. ...and while I take the point of the length of transition between the Prentice administration to the Notley administration, you forget to mention the huge transition that took place in the interim. Accusations of high volume shredding machines, large transition teams coming from Ottawa to assist the Premier-elect and her team, the ramping up of resources and ramping down of others, hiring of staff, etc al happens in that time. With the turnout that happened, there could be some races - especially in Edmonton and Calgary - that get into a 3 way race...more than we'd expect. If those ridings are also high with advanced voting, the indicative trend of the regular polls won't be enough for assumptions to be made. ...now, I don't expect that to be the norm, but that should be a chance that is mitigated as much as possible while giving the new administrators of the Alberta Government time to ramp up. If it is the incumbent, which it very well could be, then she would need to know the lay of her land as soon as possible to make strategic cabinet decisions, etc. To be clear, the 10-day period before announcing the official results has not changed since 2015. Although people assume that the unofficial results announced right after the polls have closed is determinative, that is not the case. A person can only be sworn in as an MLA after the official results are announced by Elections Alberta 10 days after polling day and the expiry of the subsequent 8-day appeal period. In other words, no one becomes an MLA until at least 18 days after polling day. This process has not changed with the introduction of "vote anywhere" advanced polls. The only thing really impacted by that change is the ability of Elections Alberta to release the unofficial results on election night, which, although somewhat annoying, isn't really that big of a deal. However, given the count on the old process gave you a fairly accurate indication of who won on election night so, as I mention above, preparations for the new Legislature will get well underway, this rather interesting swing in polling numbers could increase uncertainty. Is it going to cause anarchy in the streets, dogs and cats living together.....no. interesting just knowing the number of advance voting ballots cast in each riding as any lead more than the total number of advance ballots would still determine the winning candidate on election night. even allowing for the fact that the ballots aren't likely to be all for a single candidate, it would still be no different than the news media declaring a winner before all the poll results are in based on the results of the polls counted to that point and the number of polls still to be counted. They will be declaring most every ridings winner election night excepting of course the odd close one. Took us literally 25secs, with voter cards, in/out/cast ballot just by voting on Election day at our assigned polling station. No one hour waits, no lineups. So many people are advance voting now that the actual election day is seeing much reduced numbers. But the bonus of voting on election day is that's when they have all staff on hand in the polling stations and they basically had nothing to do. Talked to the people at the polling station and despite a good turnout the rush on election day or evening never came. So many had already stood in long lines to advance vote. Do people love lining up? Voting on election day is rarely difficult. Plus you get to talk to anybody as at any given time hardly any voters are in the place. The polling station I was at was staffed with around 20 people and there were 4 voters inside. Even went for a walk later and took a peak in and they had around a dozen voters in, not anything close to a lineup. Last edited by Replacement; 17-04-2019 at 07:01 AM. Took us about the same amount of time as you Replacement, and that was at an advance polling site here in the south side. A regional thing then? Where I live we seem blessed with so many polling stations. tbh more than required. Went for a walk and passed 3 polling stations including the one that we went to. I mean that's great access but its inordinate in this population density. People in more central or packed areas probably have legitimate complaints about lineups respectively. There should be similar per capita voting access. While I am closing many of the other election-specific threads, I will leave this one open as there are still returns to complete. Also, the topic is still discussion worthy as evidenced above. Those advanced polls really wanted Notley out! Eight ridings (5 UCP, 3 NDP) were decided by less than 1,000 votes.